The man gave names to all cattle, and to the birds of the air, and to every beast of the field; but for the man there was not found a helper fit for him. So the Lord God caused a deep sleep to fall upon the man, and while he slept took one of his ribs and closed up its place with flesh; and the rib which the Lord God had taken from the man he made into a woman and brought her to the man. Then the man said, "This at last is bone of my bones and flesh of my flesh; she shall be called Woman, because she was taken out of Man." Therefore a man leaves his father and his mother and cleaves to his wife, and they become one flesh. And the man and his wife were both naked, and were not ashamed. Now the serpent was more subtle than any other wild creature that the Lord God had made. He said to the woman, "Did God say, 'You shall not eat of any tree of the garden'?" And the woman said to the serpent, "We may eat of the fruit of the trees of the garden; but God said, 'You shall not eat of the fruit of the tree which is in the midst of the garden, neither shall you touch it, lest you die.'" But the serpent said to the woman, "You will not die. For God knows that when you eat of it your eyes will be opened, and you will be like God, knowing good and evil." 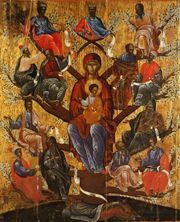 So when the woman saw that the tree was good for food, and that it was a delight to the eyes, and that the tree was to be desired to make one wise, she took of its fruit and ate; and she also gave some to her husband, and he ate. Then the eyes of both were opened, and they knew that they were naked; and they sewed fig leaves together and made themselves aprons. And they heard the sound of the Lord God walking in the garden in the cool of the day, and the man and his wife hid themselves from the presence of the Lord God among the trees of the garden. But the Lord God called to the man, and said to him, "Where are you?" And he said, "I heard the sound of thee in the garden, and I was afraid, because I was naked; and I hid myself." He said, "Who told you that you were naked? Have you eaten of the tree of which I commanded you not to eat?" The man said, "The woman whom thou gavest to be with me, she gave me fruit of the tree, and I ate." Then the Lord God said to the woman, "What is this that you have done?" The woman said, "The serpent beguiled me, and I ate." The Lord God said to the serpent, "Because you have done this, cursed are you above all cattle, and above all wild animals; upon your belly you shall go, and dust you shall eat all the days of your life. I will put enmity between you and the woman, and between your seed and her seed; he shall bruise your head, and you shall bruise his heel." To the woman he said, "I will greatly multiply your pain in childbearing; in pain you shall bring forth children, yet your desire shall be for your husband, and he shall rule over you." And to Adam he said, "Because you have listened to the voice of your wife, and have eaten of the tree of which I commanded you, 'You shall not eat of it,' cursed is the ground because of you; in toil you shall eat of it all the days of your life; thorns and thistles it shall bring forth to you; and you shall eat the plants of the field. In the sweat of your face you shall eat bread till you return to the ground, for out of it you were taken; you are dust, and to dust you shall return."